Dr. Castle is a meteoriticist and geochemist working as part of the Mars Science Laboratory MSL) science team. His background is in igneous petrology, working with Martian and asteroidal basalts. His graduate studies focused on understanding the formation and differentiation of planetary bodies from a geochemical perspective, examining igneous processes from the early solar system to today. Experimental projects related to Martian meteorites have focused on the study of the Tissint meteorite, a depleted olivine-phyric shergottite. A major finding of his study has been to demonstrate that volatiles are just as likely to be present in the depleted reservoir in the Martian mantle as to the enriched, a result achieved by detailed examination of the role of oxygen fugacity in petrogenesis. In asteroidal studies his focus has been the eucrite meteorites, where he is using experimental techniques to examine models for the igneous origin of some of the geochemical complexity on their parent body. As a member of the MSL science team, Nick works with the CheMin XRD instrument as part of the team helping determine the surface mineralogy in Gale crater. His current role is in evaluating the analytical uncertainties associated with both measurement and interpretation of diffraction pattern data returned from the Martian surface. He is also active in the ongoing study of tridymite, examining if a low-temperature formation mechanism can be identified and verified. 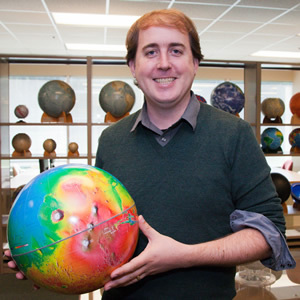 As a postdoctoral fellow at the LPI, Nick is heavily involved in education and outreach activities, helping to teach and inspire students to pursue meaningful careers related to science and space. He is actively interested in developing relationships at nearby universities to help fulfill the mandate of LPI as not just scientists but also communicators of science to a broader community.